NASA's New Horizons spacecraft has woken up from hibernation to prepare for a historic New Year's Day flyby at the edge of our solar system. 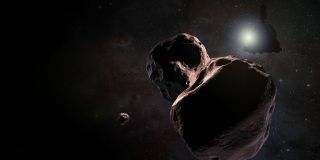 "Our team is already deep into planning and simulations of our upcoming flyby of Ultima Thule and excited that New Horizons is now back in an active state to ready the bird for flyby operations," the mission's principal investigator, Alan Stern, of the Southwest Research Institute in Boulder, Colorado, said in a statement. Over the first three days that New Horizons is awake, the mission team will send the first of many commands to the spacecraft's onboard computers. Next, the team will update the craft's memory, retrieve science data about the Kuiper Belt and complete a series of systems checks. These initial steps will last approximately two months, and flyby operations and distant observations of Ultima will begin in late August, according to the statement. Ultima Thule, officially named 2014 MU69, is a world that orbits approximately a billion miles beyond Pluto. Ultima Thule was chosen as a nickname for this object, with public input, because it means "beyond Thule," or beyond the edge of the known world. The name signifies just how extraordinary this flyby will be, as it will be beyond anything humans have ever before accomplished.